Demonstrators disrupting an event with Israeli speaker at UCL campus. 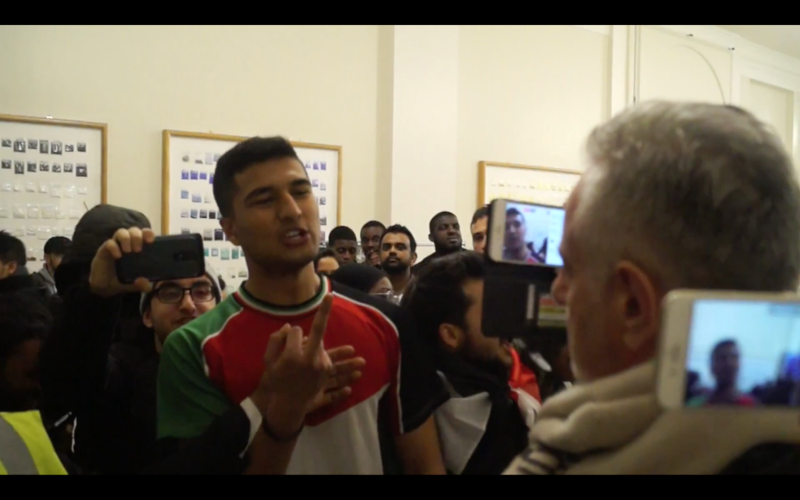 A number of students at University College London (UCL) are to face a disciplinary panel after a confrontation on campus last October, when a former Israeli soldier flew in to speak to pro-Israel students. However, a report into the event has also showed that the clash could have been avoided altogether had University bosses not over-ruled two prior decisions by the Student Union not to hold the event on security grounds. UCL President and Provost Michael Arthur and Vice Provost Rex Knight gave the go-ahead for ex-IDF soldier-turned-activist Hen Mazzig to speak at the prestigious London campus despite the Union having twice ruled that it would be inappropriate. The circumstances leading up to the Friends of Israel Society event were outlined in a report published this week, following an internal investigation by Professor Geraint Rees, Dean of the UCL Faculty of Life Sciences. Rees said that, in its application to the Union, the Society had “stated that security was not required, that the function would not attract media interest and that in the past, the speaker and topic have not generated any controversy”. The University’s Security team grew concerned, however, after the Society began advertising the event. The Union then discovered that Mazzig had also spoken at an event at King’s College, London, in 2014, which had attracted confrontation. The Union rejected the Society’s application, on the grounds of “failure to disclose full information on the speaker”. An appeal was also rejected, on the grounds of no new evidence being presented. However, UK Lawyers for Israel (UKLFI) advised the Friends of Israel Society, led by Liora Cadranel, to apply directly to the UCL President, who overturned the Union’s decision and gave the green light, pending a risk assessment. The event went ahead and attracted protests from pro-Palestinian student groups, leading to scenes of confrontation, and students climbing through windows to get to the event venue. Several pro-Israel students later said they were “physically abused”, by protesters. The fracas was captured on film. Rees says anger over Arthur and Knight’s was shared online among pro-Palestinian students, who booked a room in the same building to gain access ahead of Mazzig’s talk, despite the Friends of Palestine Society deciding not to organise a protest. Having seen video footage and taken witness statements of subsequent events, investigators concluded that both pro-Israel and pro-Palestinian students were being antagonistic outside. Police entering UCL, where the protesters disrupted the pro-Israel event. 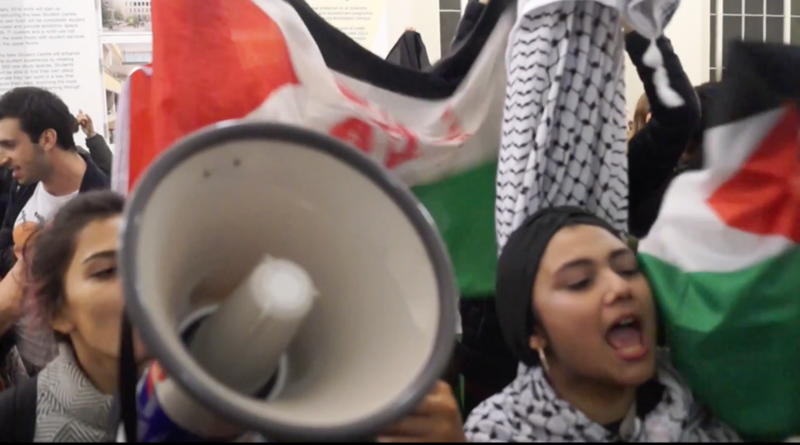 However, as Security dispersed the event, students moved to another location – the Haldane Room – where they were followed by pro-Palestinian demonstrators, who then “created a verbally intimidating atmosphere by shouting, chanting and banging on the window and door, augmented by amplified loudspeakers,” said Rees. 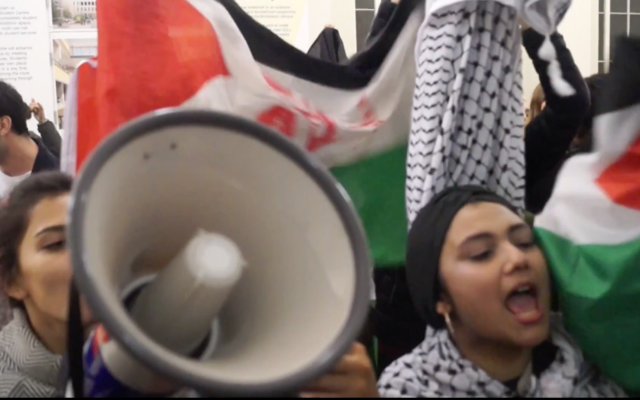 One pro-Israel activist was captured on video behaving in a manner than “could be interpreted” as being aggressive towards Islam and is understood to have been identified by Rees as engaging in “physically aggressive behaviour”. Rees’s report records these actions as “unacceptable” and “Islamophobic”. Rees said three protesters (two of whom are UCL undergraduates) then climbed in through an open window, lying on the floor of the Haldane Room. One unnamed attendee is recorded as being “verbally hostile to the protesters, stamping her foot in the vicinity of one as he lay on the floor”. Minutes later, the protesters were removed. When the police arrived, UCL Security decided against asking officers to forcibly disperse protesters “as at that time no serious violence or property damage was evident,” although the “noisy demonstration and banging on windows continued intermittently”. While most of the chanting was acceptable, Rees took issue with those singing: “From the river to the sea, Palestine will be free.” He said this “appears to be calling for the destruction of Israel” and “could be considered anti-Semitic”. Rees said that while complaints of “assault” from attendees were either withdrawn or unsubstantiated, the protesters nevertheless created a “highly disruptive and intimidatory” atmosphere, and advised that disciplinary action be considered for some students, whose names were redacted. In summation, Rees said that although there was no serious violence, the demonstration represented “a sustained attempt to prevent free speech on campus within the law that went beyond a legitimate vigorous protest”.